The production of industrial machines requires design abilities and cutting-edge technological solutions, as well as a focus on total quality control. 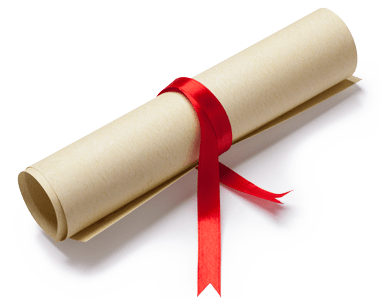 For this reason, we take the current regulations as a standard and commit to satisfying the strictest certification rules. 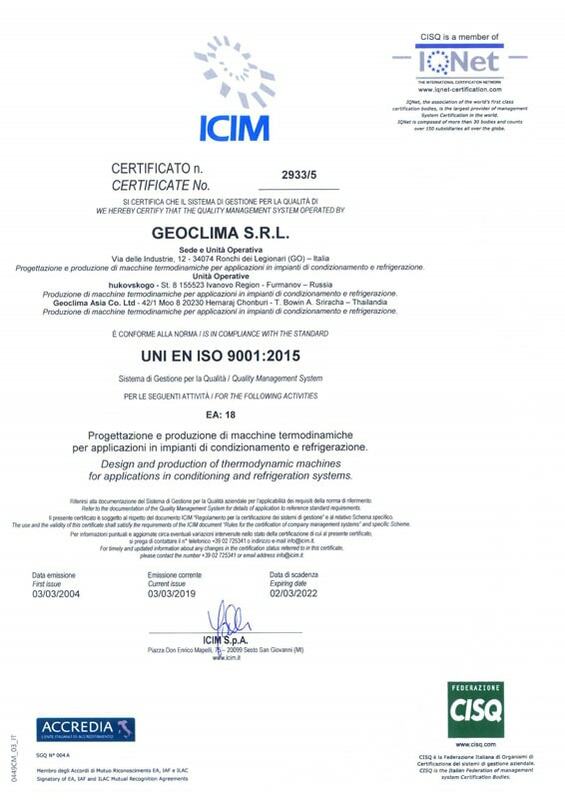 Geoclima is certified UNI EN ISO 9001:2015 for the quality of the management system of Geoclima Srl and of production facilities of Geoclima Russia and Geoclima Asia. 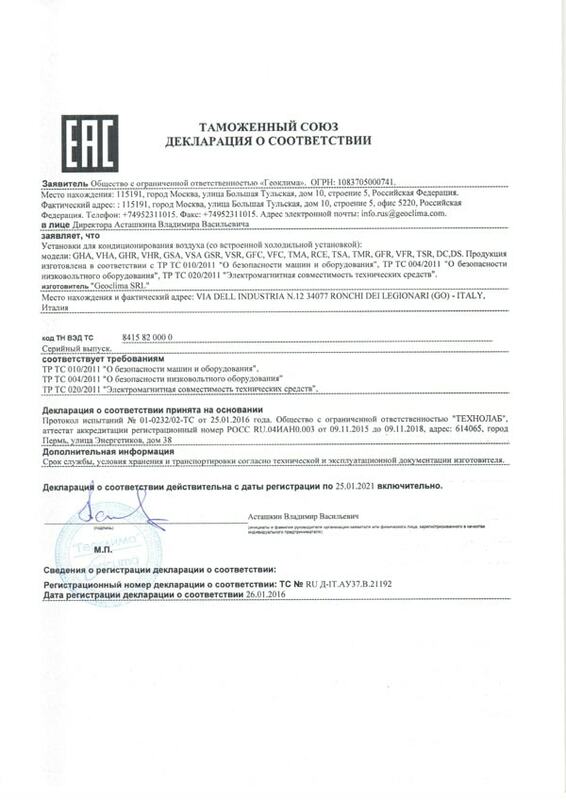 In July 2014 we obtained the F-Gas Company Certificate for the “Activities of installation, maintenance or servicing of stationary refrigeration, air conditioning and heat pump equipment containing certain fluorinated greenhouse gases”, in compliance with DPR N 43 of 27 January 2012 and European Regulation No. 303/2008. 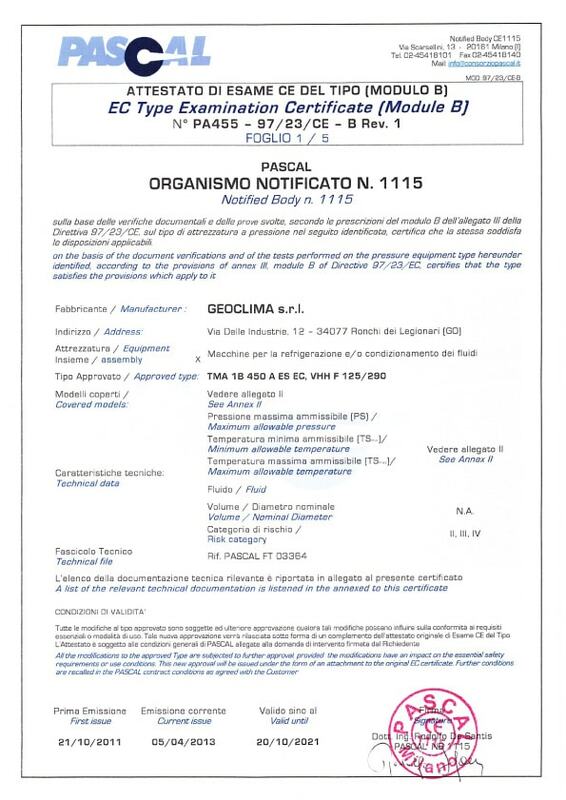 Geoclima is registered in the (Italian) National electronic register of certified companies and individuals: www.fgas.it. 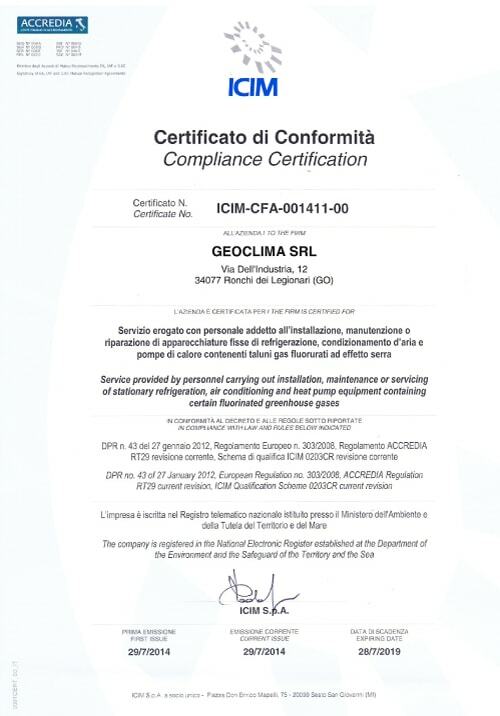 Geoclima earned also GOST R certification for the Russian market and PASCAL certification. 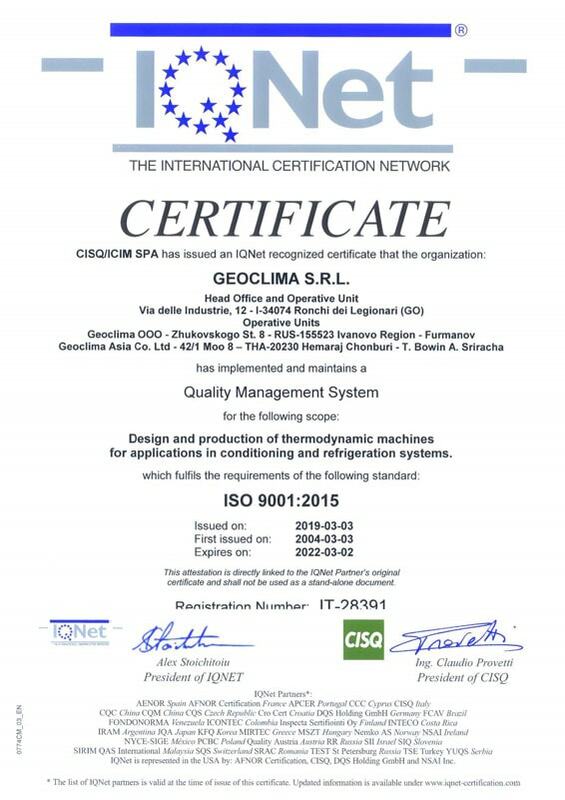 In 2017 Geoclima has earned the trusted AHRI® mark, an assurance of the product’s performance, both for the water cooled (AHRI WCCL) and air cooled (AHRI ACCL) ranges of products as an Original Equipment Manufacturer. 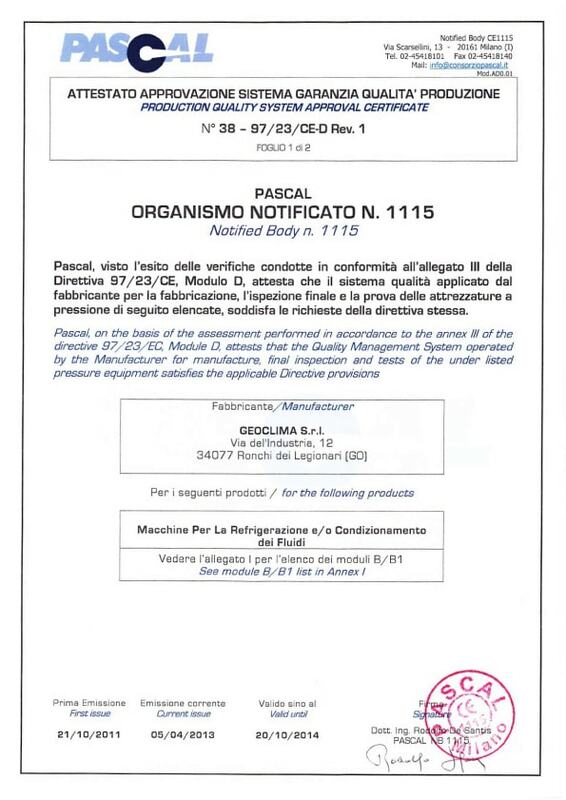 With AHRI certifications customers and end-users are assured that Geoclima Water and Air Cooled Chillers will perform in accordance with the performance values declared in the technical documentation and in the selection software Geoselectool. We have opted for the AHRI certification as it ensures higher quality standards than Eurovent. AHRI certification applies to all operating conditions, so that all data generated from the system are certified. 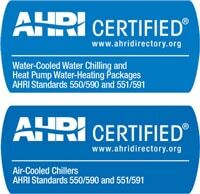 AHRI certificates air cooled chillers up to 2110 kW (600 RT) and water cooled chillers up to 10551 kW (3000 RT). AHRI requirements are much more stringent and restrictive and apply to all methods and procedures adopted during the testing phase, in addition to the procedures for the laboratory approval.